This is a fascinating archival glimpse at the music created in the mid-1980s by the Polish ensemble Legendarne Zabki (Legendary Teeth), which was one of the very few acts playing improvised music and creating avant-garde sound collages at the time. The ensemble comprised of saxophonist Ryszard Wojciul, pianist Robert Wyszynski, bassist / cellist Boleslaw Blaszczyk and drummer Jacek Alka. Several other musicians also participate in these recordings, which were made during a two years period, after which the ensemble disbanded. The album includes twenty one tracks, recorded privately by Alka on amateur equipment at various locations. 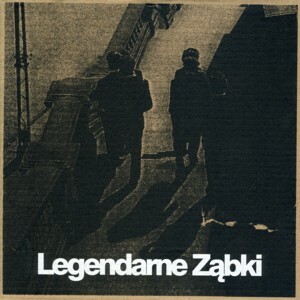 At the time Legendarne Zabki were active Poland went through the roughest period in its post-WWII history, with the Martial Law imposed upon its population between 1981 and 1983 and a deep economic crisis lasting throughout the decade. Music was one of the escape routes for the young Poles, with the vast majority choosing Rock as their preferential genre, which resulted in the explosion of Rock music in the country. Young musicians, who selected Jazz and Free Jazz in particular, were a tiny minority. Therefore these historic recordings bring to light an almost completely lost chapter of the country's musical history. The music, presented chronologically, shows a steady development of the ensemble from Free Jazz towards experimental Improvised Music, which also incorporates literary works of philosophy, prose and poetry and avant-garde influences. The importance of such music is mostly in the fact that it was done at all at the time. Listening to it today exposes the lack of experience of the young participants and their detachment from other Improvised Music activities in Poland and abroad. Although the ensemble lasted only a couple of years, these musicians continued to make music together from time to time and are still a part of the Polish Improvised Music scene today. The album is released in a beautiful unique packaging and is a Limited Edition of 300 copies only. It is a collectors' item and enthusiasts of Polish music should find this an intriguing addition to their collection. Check it out!